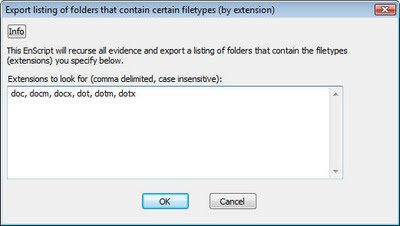 Computer Forensics, Malware Analysis & Digital Investigations: EnScript to show what folders have certain file types, calculate total bytes and number of files. EnScript to show what folders have certain file types, calculate total bytes and number of files. This EnScript was written by a request to display all the folders that contain a certain file type (by extension). The EnScript will also calculate the sum of the file types in each folder and file count in each folder. Can you change this script to use the sile signature database in EnCase, rather than file extensions? We are about to release a tool called FI Data Profiler Portable, that will perform this task across 3,410 types of files identified by their contents. An EnCase scripted solution wouldn't be as accurate, but it would be interesting to see if it is possible. We might also be interested in providing a plugin to EnCase to raise the accuracy. Yes, it is certainly doable.